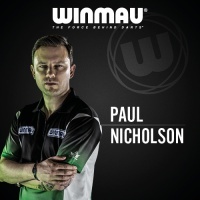 Paul Nicholson has began to make a superb return to form since recovering from injury and regaining his Tour Card in 2017. The former PDC major winner enjoyed a run to the semi-finals of the Gibraltar Darts Trophy earlier in the year and is continued to improve on his game. We spoke to “The Asset” to dig a little deeper in to his resurgence and how he’s adapted to his new darts. The peak of the PDC season is approaching, how do you feel the season has gone so far? I am very pleased with the way this year has gone. I put in some smart practice this year, and didn’t overwork. I have had wrist issues for the past few seasons, and with that in mind, I utilised my new hold on the dart consistently and practiced accordingly. Have you set yourself any targets for the rest of 2018? The only target I had for this season was to keep my tour card, so that I didn’t have to go through Q-School again. I was ready to call it a day if I didn’t keep my card, but it’s looking very likely that I will be playing again in 2019. Beyond that, there were things that I wanted to do, but I focus these days in short bursts and don’t look too far ahead if I can help it. It was great to see your run to the Gibraltar Darts Trophy semi-final in June, defeating Dave Chisnall, Gerwyn Price and Joe Cullen on the way. How did it that run feel? It felt almost surreal. I did get some good fortune to beat Joe and Gezzy, but I felt that I played well against Dave and against Adrian in the semi. It was just nice to be at the thick end of something and give myself the knowledge that I am still good enough to compete. I walked away from that event with a big smile, and that’s what I will remember most. Have you made any changes to your practice regime in recent times? In all honesty, not really. I have been doing the same things for years, but lately there has been one major addition, and that is playing cricket. After dabbling in some soft tips darts at the end of 2017, I was taught how to play cricket by Adrian Gray, and I felt immediately just how much it can help your game and your match focus. Is there any difference in how you approach your preparation to tournaments? I am not as intense as I once was, but I think that’s just experience playing its part. However, I think the intensity may return if and when I grace my favourite stage again. I do like to be alone for a few minutes before a game starts, which is why you will always see me with my music in my ears up until the game commences. Have you made any physical health/lifestyle changes to improve your game? Due to injuries to my neck, shoulder and throwing wrist, I have had to make changes. I used to love doing high intensity training to stay fit, but that has had to go by the wayside now, and these days it’s all about yoga which is good for injury prevention and excellent for my mind. I think getting older, you have to adapt this side of things and maintain some level of fitness otherwise you will not be in the right shape for long events. I am an avid golfer too, and the walking side of that is fantastic for me. Is there anything that you’ve changed in terms of your mental approach to the game? I wouldn’t say so. I have always sought the reasons behind my need to be different, and my drive to succeed, but I think just growing up a little over the last few years has allowed me to chill out a bit on stage, but I do feel there is something inside me that is screaming to get out again. What that is, I am not even sure yet. Previously you had been given the tag of “The bad boy of darts”, in recent years we’ve seen you shake off that tag somewhat, was this a conscious decision? Has it helped your game on the oche? I didn’t really have a choice but to calm things down a bit. All I wanted to do with the image was bring some unpredictability, some aggression and some showmanship for the fans. I felt that having a little bit of nastiness helped me at the start of my career, but if fast became derogatory to my mental health and my personal life. So, with the help of the DRA and my friends and family, I have tried to move on from those things, but deep down I know I can still bring a cheeky salute or two. We’ve seen a significant change in your latest darts, namely the grip. What were you looking for initially when you began working on these with our engineers? I needed the grip to be more consistent along the whole length of the dart and focused in the middle of the barrel. The grip that the engineers recommended for me was spot on. I wanted something aggressive but not too aggressive and the current grip pattern suits me perfectly. You mentioned the big change in the barrel’s grip pattern, what made you settle on this? This is no word of a lie when I say this, the engineer gave this grip pattern to me to try and it has not changed a bit since. He just knew what I needed and I have stuck with it. If I was to say to him, I need this, this and this, he can put it on a dart without even seeing me. Winmau are that good. Have you adjusted your grip position/type on the dart to accommodate this new grip? I have had to because of injury. I used to grip the dart so it would land flat, but due to wrist problems I have done a complete ‘180’ and now I get them to go the other way. Consequently, after a lot of hard work with my second grip change in 2 seasons, I am now very comfortable with what I am doing. I have modelled my new grip and throw on Gary Anderson, and it has worked very well. Has your throwing action change at all during the change to these new darts? The actual throwing action hasn’t changed, but I feel that my follow through is a lot more relaxed, and has less shoulder movement. This has helped my scoring as I am hitting less 5’s and after looking at stats this season, they don’t lie. Rhythm is always a key factor when it comes to a player’s action, have you slowed/quickened your throwing rhythm at all during your return to form? I would say I am a tad quicker now. It’s just the way my throw has evolved with the new grip and I feel more comfortable throwing a tiny bit swifter. My approach to the oche is still very deliberate and that hasn’t changed a bit. You of course became a PDC Major winner in 2010 by defeating Mervyn King in the Player Championship Finals, pinning double 8 for the 13-11 victory. How was that as an experience? It was great. A lot of people ask me too much about how it was to beat Phil Taylor that night in the semi-final. I didn’t really idolise Phil growing up, but I did admire Mervyn and his game an awful lot, so the fact that I was able to capture that title over him, and to call him a friend since then is super nice. When I look back at who I beat for that title, I know I deserve every bit of it. I think my rhythm is very similar to back then though. I work hard on the tempo side of throwing and I have maintained the same sort of speed throughout my career. How would you compare your game then to how you are throwing now? It’s hard to say. I honestly think I am a better scorer now, but based on shear confidence and naivety to pressure, I was a better finisher back then. I wouldn’t change a thing though, well maybe the world cup final and the European darts trophy final in 2013 which I should’ve won, but these things are all part of the journey and mine has been a rollercoaster so far.